Once a year the Earth moves through the debris of an old comet called Swift -Tuttle, creating a display of shooting stars in the night sky from late July until late August. At it's peak on the 12th & 13th August (and with good viewing conditions) it is possible to see 60-70 shooting stars per hour, in a good year more than 100. Star gazers will be looking for clear, cloudless skies to have the best possible chance of catching a glimpse of the meteor shower, but this weekend our weather turns a little more unsettled! THE BEST CHANCE OF SEEING THEM? Although the peak is officially during the early hours of Monday morning, the skies are clearer Friday night. Saturday night looks cloudy and wet. Sunday there will be clearer breaks mixed with showers. An added bonus this year is that the Perseids' peak coincides with a 'new moon', meaning skies will be darker than usual - increasing the chances of catching sight of them. 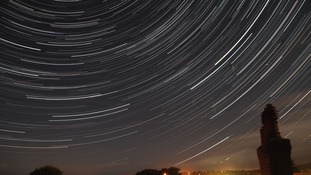 To see the meteor shower you don’t need a telescope, binoculars or any other equipment. All you need is your eyes! Although it may be quite tempting to try and take pictures, this is actually quite difficult. Unless you have a high spec camera it's best to just enjoy the moment. For best results find a location away from light pollution, the more rural the better! Find a spot away from bright lights and let your eyes get used to the dark. (This will take about 15 to 20 minutes). Dress accordingly as August evenings can get quite chilly. Rural spots on Friday night could dip down into single figures (5-7C in well sheltered locations). Get comfy, as it may take a while! Lay on a reclining chair or lounger, or just put a blanket on the floor. You do not need to look in any particular direction as meteors appear randomly anywhere in the sky, but your are more likely to see them in the early hours, just before dawn. The most important thing is to be able to keep looking up, filling your gaze with as much sky as possible, for as long as possible. The patient observer will be the luckiest - it can take quite a few minutes before you see a shooting star so don’t look away, you may miss one!